There are some who just don't see it yet. Yesterday, on Hannity, Bob Beckel uttered the worn out complaint of the left: Sarah Palin has no policy positions and no substance. He couldn't be more wrong. Sarah Palin had more policy substance written on the palm of her hand in Nashville than Barack Obama could ever squeeze on to a teleprompter. If you don't believe me, just read her Facebook Page and listen closely to what she says during speaking engagements. It's so simple, it might just fly right over your over-educated mind. Like someone who stares at the manual while fixing a car, sometimes you just need someone to say "just tighten this bolt right here." Is that it? That's it. Those who look for bold messianic statements bloviated off a teleprompter won't see it. Those who think the Republican party needs to elect RINOs won't see it. Those who think Palin is unqualified because she's a woman or didn't get the right degrees or go to the right college, won't see it. They are simply blinded by the light. They are in denial. If America doesn't believe Sarah Palin then she will have to learn it for herself. When the student is ready, the teacher will appear. Those old enough to remember know what home is like recall that it's a shining city on a hill. Tap those slippers together and repeat after me: "there is no place like home." It was morning there once. It will be morning again. Those who have not yet been there are in for a treat. 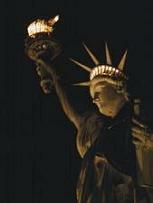 Believe the one who carries the torch now and follow the light of liberty's lamp.